These are some web sites I worked on between 2002 and 2007 in Berlin. 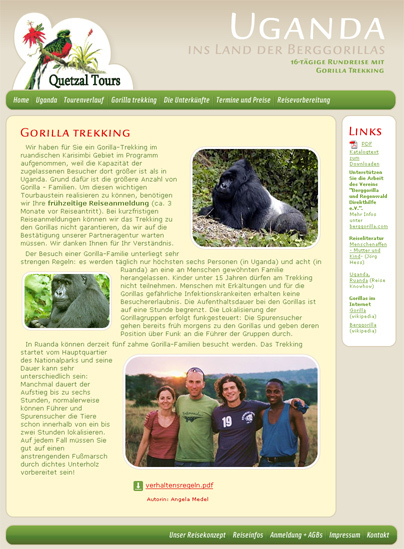 Some are probably offline or have been replaced by a new site now in 2011.
http://www.quetzal-tours.de http://www.gorillatrekking.de Site design, programming, search engine optimization. About 60 HTML pages. 11 page PDF catalog. Design concept. http://www.sich-lieben-lernen.de Web portal for women, PHP driven. Includes Flash chat and PHP forum. Backoffice to edit all content. Design concept by Juano. http://www.massimosex.com HTML website with Flash menu. Scans image folders automatically to avoid editing pages. Simple contact form. http://www.davidmonros.com Added new content to the existing website of this know artist from Menorca. Improved Flash menus, added map + video. Note: this site has been replaced by a new one in 2010.